Take Off! 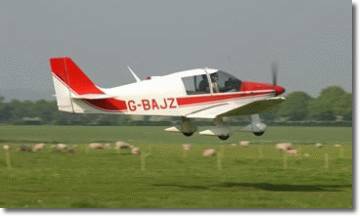 - the thrill of taking to the skies for the first time in the comfort and safety of a modern training aeroplane, is a fantastic gift. If you can drive a car, you can easily be taught how to fly a plane. You will get to handle the controls under expert supervision, plus, if you would like, you can actually have a go at a landing! Or if you prefer, just sit back and enjoy the ride! 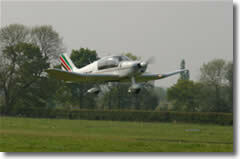 A Robin DR400 Training Aeroplane - this is typical of the kind of machine in which we can teach people to fly. It is comfortable and safe, with excellent views out of the cockpit. This aeroplane has extra seating in the back so that two people can share the thrill. Enjoy the thrill of taking to the skies with panoramic views over the countryside. Rest assured that your instructor will be a high hour professional airline pilot with thousands of hours in this kind of aeroplane. Take the controls or just enjoy the ride in the comfort and safety of a modern training aircraft. our secure server at aitsafe.com. A full briefing and comprehensive insurance is included.